Apple pie bourbon, and bourbon apple pies!?! Yes, that’s right. Last winter I posted a recipe for Apple Pie Bourbon, which is an infusion of apples, cinnamon and vanilla bean in bourbon. The result is a delicious concoction that tastes like you are drinking an apple pie (perfect for the holidays). That post continues to be one of our most popular. And if you haven’t made it yet, now is a good time to start. This is a great time of year to infuse apples, as well as other fall fruits. When you strain the apples out of the bourbon, save them so that you can make Bourbon Apple Pies (discard the cinnamon stick and vanilla bean). You will be glad you did! If you aren’t ready to use them immediately, you can keep them in the freezer. 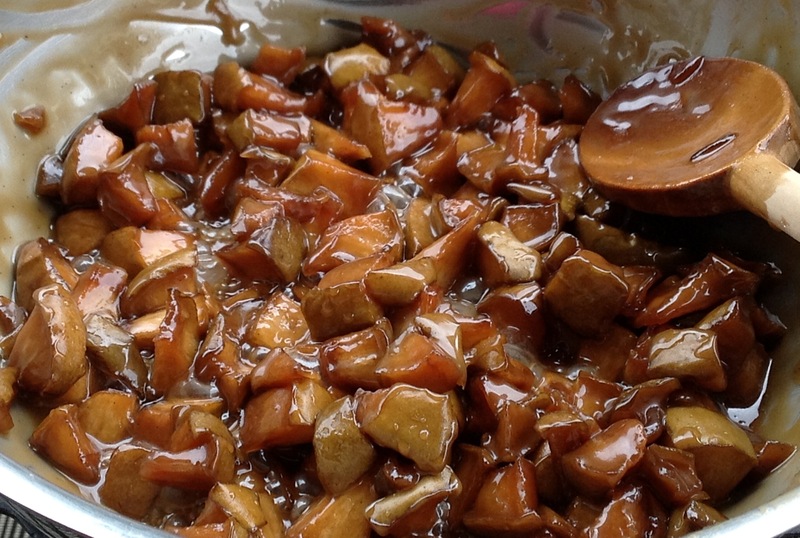 Roughly chop the bourbon-soaked apples into 1-inch pieces. 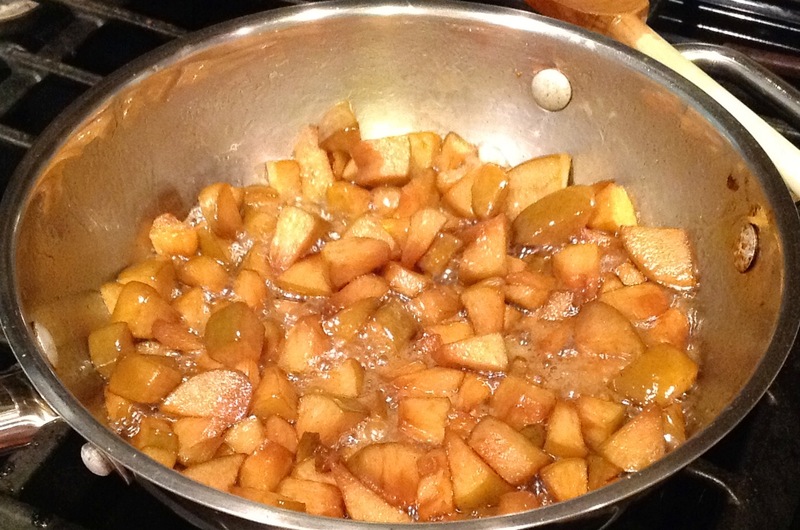 Place the apples, butter, 1/2 c. brown sugar, lemon juice and salt in a medium, heavy bottom saucepan. Bring the mixture to a simmer on medium heat, stirring frequently. Reduce heat to low and simmer for 15-20 minutes, continuing to stir frequently. When the apples are tender and much of the liquid has started to thicken, make a hole in the center, and whisk in the flour. Taste the mixture and if desired, add another 1/4 c. sugar. Simmer and stir for another 2-3 minutes. 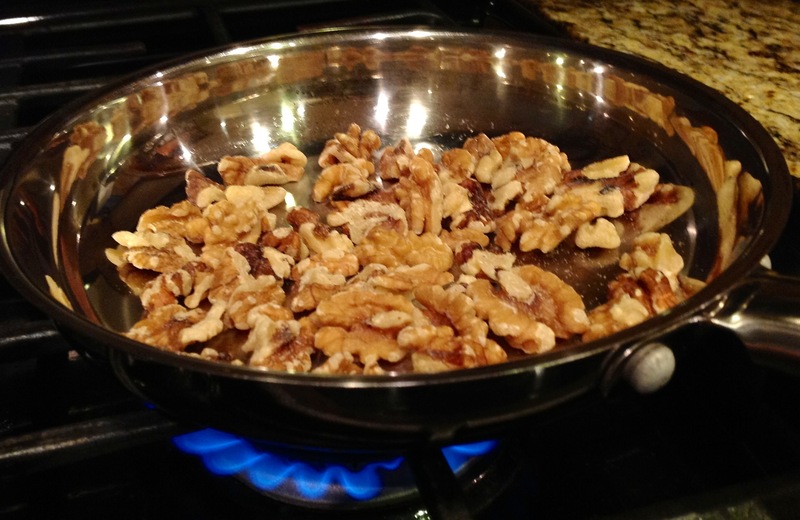 Remove from heat and stir in the toasted walnuts. Set aside. 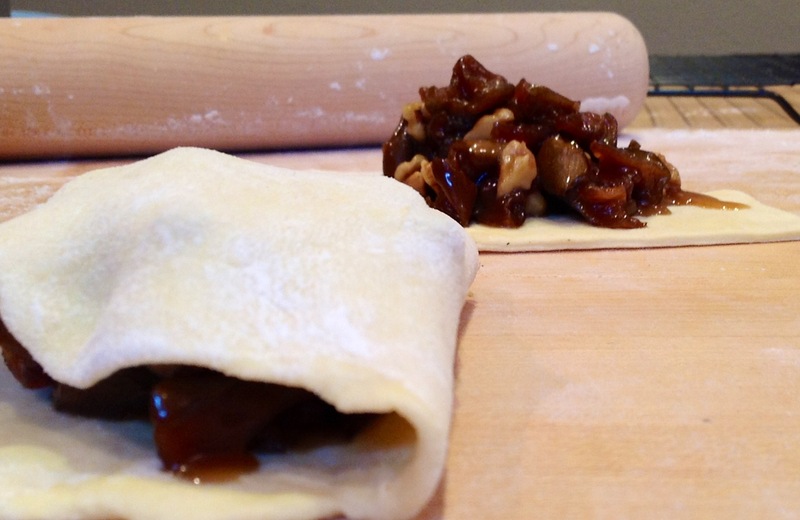 While the apple mixture is cooking, set out your puff pastry and allow to thaw. I’m not much of a baker, so I opted for the pre-made puff pastry. 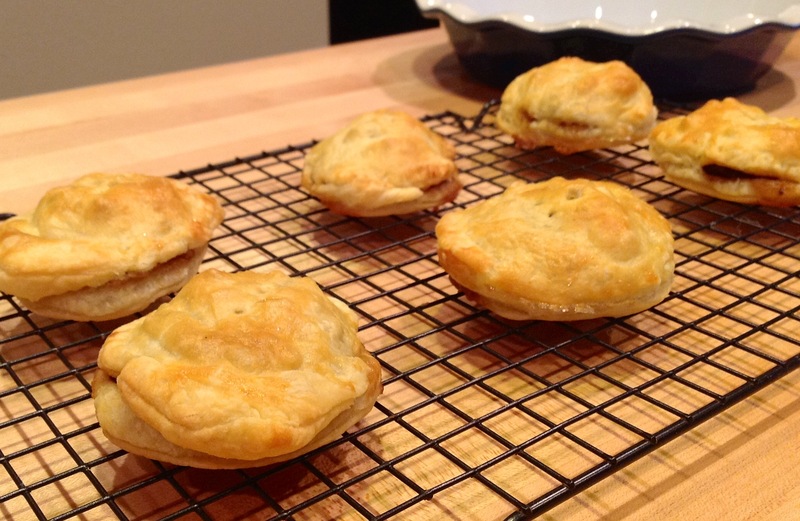 Alternatively you could make your own crust and use the filling in any manner of pies. We made these into small hand pies. When the puff pastry is thawed, coat your countertop with a thin layer of flour and roll out the pastry until it is about 1/2 thickness of the original. This would make about 4 large hand pies. 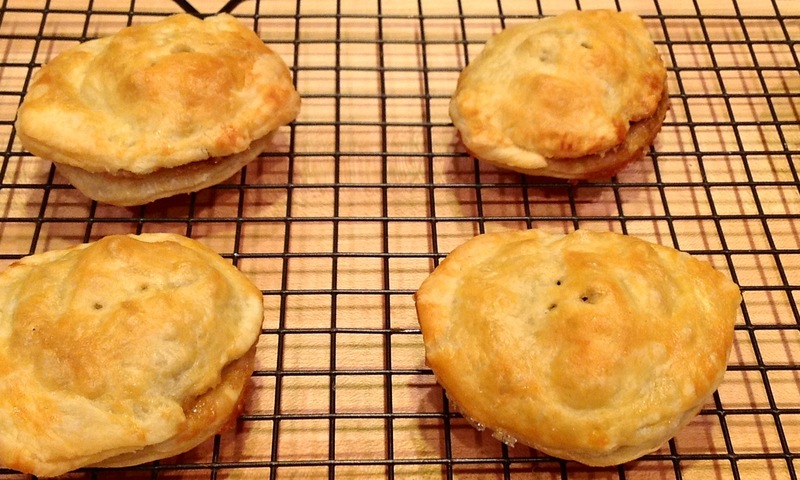 We made into 6 small and 2 medium hand pies, but the ones with more apple mixture were preferred. Next time I will make these all medium to large sized. 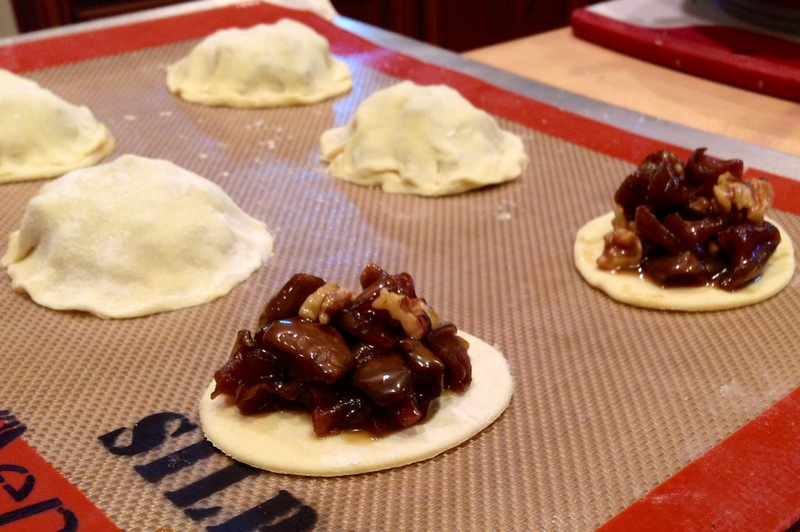 Cut the puff pastry into the size and shape of your hand pies. Place on a baking sheet that has been lines with a silicone liner or parchment. 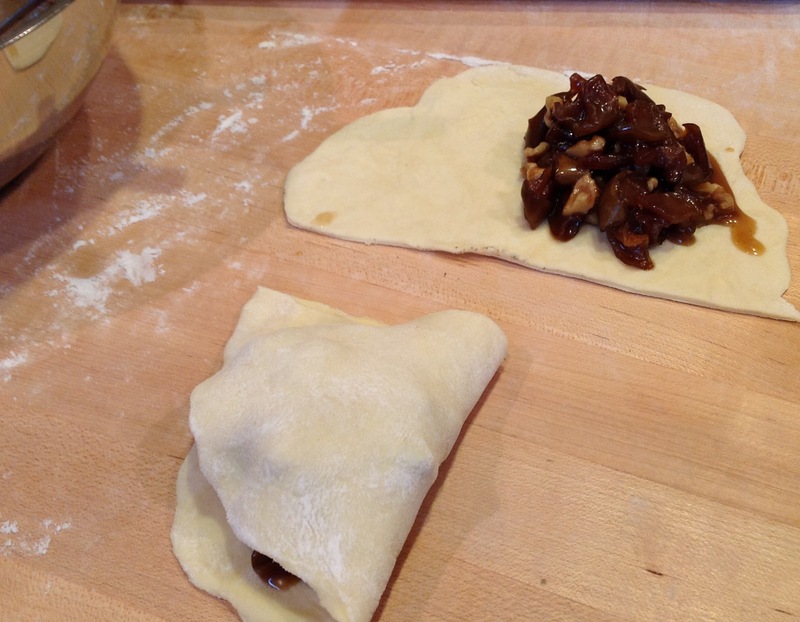 Spoon the apple mixture onto the dough. Don’t spoon too much liquid into the pies, it will run out and get messy while baking. Crimp the ends/sides of the dough together and vent with a few holes on top. Create an egg wash by whisking together the egg and 1 TB water. Brush each pie lightly with the egg wash.
Bake in a 375 degree oven until the dough is fully cooked and golden brown. The small pies took about 15 minutes, and the medium pies took about 23 minutes. If you are making larger pies, they will take a little longer. Watch them closely. Allow them to cool, then serve. I made these small to accommodate a larger group, but next time I would make these the medium to large size. The apple mixture is the star. The filling would also be nice served on pancakes or ice cream if you want to skip the crust. Any way you make this, it will be delicious. Categories: Food, Recipes | Tags: apple, Bourbon, cinnamon, dessert, Food, Liqueur, walnut | Permalink. These look delicious! I’m definitely trying this recipe next time I make apple pie! Thanks! And if you start out by making the bourbon infusion, you will be really happy! Added this to my vast collection of recipes. And definitely will be making that bourbon infusion! These look amazing!! And now I’m going to have to start by making some Apple Pie Bourbon!! As a side note, I just started our first infusions yesterday — the caramel apple liquor and the chocolate-orange liquor. Going to do serve the caramel apple with hot apple cider for our Thankful with Friends party coming up, and the chocolate-orange will be for the Christmas dessert and cocktail party! Thanks Kenley, I’m so excited for your infusions! It sounds like you have the perfect occasions to use them. Cheers! Thank you, thank you, thank you! I am honored and am really enjoying your blog too! Holy cow! That looks great. I think I will make this for my husband for Thanksgiving – he prefers apple pie on the holidays. Just perfect! Jaw dropping. These look and sound so yum. We love both apples and bourbon around here. 🙂 These are a must! I’m going to take that as a huge compliment because your desserts always look so amazing! I hope you do try them! Looks like you have another winner here. I can just smell them baking in my oven. That looks so tasty! Where do you come up with these recipes? My hubby would LOVE you to pieces. Thanks Lauren, I just saw your recipe for chocolate coffee bourbon cupcakes! they look so rich and decadent! Blissful and boozy sounds wonderful! These look outstandingly perfect! Love the bourbon! Thanks so much, they were quite tasty! But how can you go wrong with bourbon, brown sugar and butter?